Pac-Man Brings Horror To A Whole New Point Of View. When you think of Survival Horror you immediately think of Silent Hill, Resident Evil and of course Pac-Man. …Wait what? Freelance developer Tom Davies brings new life to the classic top-down arcade game. By replacing the maze overview with a first person view of dark ominous corridors. 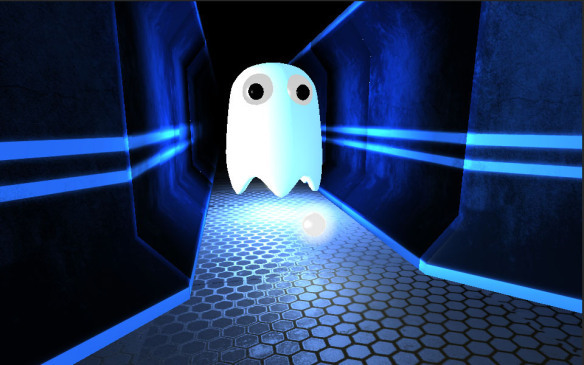 The little silly confused ghosts with immense merciless killing machines. And the amusing barrage of “waka waka’s” with chilling music and the sound of your childhood being devoured by The Killer Rabbit of Caerbannog. Well maybe not that bad… But still very chilling! FPS-Man (First Person Shooter Pac-Man) manifests the dark creepier side of the ever hungry yellow puck. While still keeping the addictive nature of the original. Just don’t play it in the dark. The atmosphere is very scary yet the style is still retro, which is a winning 1-2 punch in my book. Inky, Blinky, Pinky and Clyde return as the antagonists in this installment (being synonymous with pac-man and gaming in general) Though in this First Person Horror adaptation i’d like to refer to them as Killy, Stabby, Maimey and Destructor (the pink one of course). It’s free so what do you have to lose?…. except your soul. ← Sony’s SmartWatch 2 to clock in July 15th? Yes, most games are exactly that when you boil issues down. The important factors is what you contact the system, and if I can play an elf. I can already tell this post took you like 15 minutes to write….. My advise is “read” if you read it will help you with your vocabulary as well as provide you new ideas. As a professional photographer myself, I know that facilities set-ups and dealing with light, followers, surfaces, props etc.